Biofuels for Europe In order to have a science-based, understandable source for information on biofuels, a selection of biofuel experts from the academic world have summarized the latest science on key biofuels issues such as the impact on food and land, GHG emissions, energy security and cost-efficiency and have presented it on this website, “Biofuels for Europe”. The contributions are documented with facts and figures including references to existing reports and studies that should be easily understandable. In addition, via the Biofuels for Europe website, the opportunity to ask contributing academia questions on biofuel-related science issues is available. 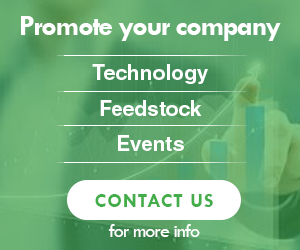 This website is supported by four companies: BP, Novozymes, Scania and Shell and is managed by a third party independent consultant, Meghan Sapp, who has held roles such as Senior Editor for Biofuels Digest, Editor of Sugaronline.com and Secretary General of Partners for Euro-African Green Energy. 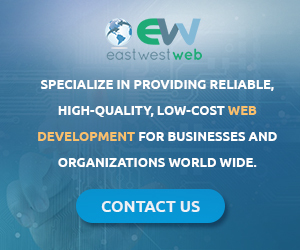 All BioWeb content is contributed by experts in their fields and vetted through an academic peer review process. Use the left bar links to navigate this rich source of peer-reviewed information related to biomass and its utilization. National Science Foundation. Green Gasoline: A Renewable Petroleum Alternative From Plants: Includes fact sheets, videos, highlights from NSF panel discussions. National Energy Education Development Project includes Curriculum Resources by subject matter. Although some information about renewable fuels in included, the emphasis is on fossil fuels. Ethanol-Blended Fuels: This curriculum on ethanol and its use as a fuel was developed by the Clean Fuels Development Coalition in cooperation with the Nebraska Ethanol Board. This material was developed in response to the need for instructional materials on ethanol and its effects on vehicle performance, the environment, and the economy. As a renewable alternative energy source made from grain and other biomass resources, ethanol study serves as an excellent learning opportunity for students to use in issue clarification and problem-solving activities. Ethanol illustrates that science and technology can provide us with new products and new uses for products. This curriculum provides teachers and students with the basics needed to understand the use and production of ethanol. After sorting out the facts, students can reach their own conclusions about using ethanol as a fuel in their vehicles–and if it is in the interests of the state and nation to do so. The curriculum begins with “Module 1: Introduction to Ethanol.” This module contains basic challenges, history, and reasons for alternative fuels, especially ethanol. This curriculum may be taught as a unit or topics may be integrated into other units of instruction. It is suggested that Module 1 be used to lay the groundwork for any number of the remaining modules. The materials on this website were developed by teachers and professional educators associated with the Great Lakes Bioenergy Research Center with input from our scientists. The materials are designed to engage students in learning about science and engineering challenges associated with producing sustainable biofuels. All materials are aligned with the Next Generation Science Standards (NGSS) and designed to fit within the curriculum of standard K-16 science courses. Materials include investigations, shorter stand-alone activities and readings, as well as longer integrated units. Use the sort and search features to find materials that meet your needs. Alternatively you can browse a list of our materials sorted by NGSS Performance Expectation or browse the NGSS performance expectations for each activity. For additional bioenergy labs and activities developed through participants in our Research Experience for Teachers program, visit the RET Projects page. 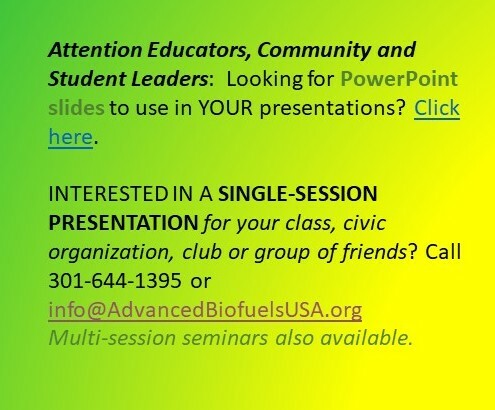 Open-Source Biofuels Educational Material. 16-week course dates to 2006. The Ethanol Minute is a national radio show broadcasting interviews with experts from all walks of life including elected officials, celebrities, energy and environmental experts, and businessmen and women. Energy 101, a series of YouTube videos created by the US Department of Energy to introduce and inform citizens about what is being done to develop alternative sources for our energy needs. See the biofuels video and the algae-to-biofuels video. The UT conversion team has created an education module that pertains to the use of biochar as a soil amendment. In this module, students will use biochar in an effort to determine what affect it has on the growth of various types of seeds. Students will plant seeds in the presence and absence of biochar and monitor the growth of the plants for a period of time. Comparisons in crop yield will demonstrate the effects of biochar as a soil amendment. The module is designed to align with Common Core and Next Generation Science Standards. This module is suitable for middle and high school students. See also the Government Resources page. The Dynamic Maps, GIS Data and Analysis Tools Web site provides dynamically-generated maps of renewable energy resources that determine which energy technologies are viable solutions in national and international regions. For a quick snapshot of U.S. resource maps for various renewable energy technologies, including US biomass resources, access the Renewable Energy Technology Resource Maps for the United States PowerPoint presentation on the NREL map web site. This site also provides access to the NREL FTP site where you can download data and Geospatial Toolkits. The National Renewable Energy Laboratory’s Geographic Information System (GIS) team analyzes wind, solar, biomass, geothermal, and other energy resources and inputs the data into the GIS—Geographic Information System. Read more about NREL’s GIS team and the map server that creates the dynamically generated maps. For help with the maps you can access a video tutorial that will show you how the dynamic map sites work. EPA’s Renewable Energy Interactive Mapping Tool (KMZ) (2.2MB), a Google Earth KMZ file, makes it possible to view EPA’s information about siting renewable energy on contaminated land and mining sites, alongside other information contained in Google Earth. It enables the user to search by renewable energy type or by contaminated land type. In addition to the site’s location, it also provides: site name and identification information; EPA Region and program managing the site; a link to the site’s cleanup status information; and specific acreage and renewable energy resource information. International Energy Agency earlier this year completed its mapping of global second-generation biofuels demo plants and projects. You can search by type of plant (biochemical, thermochemical or hybrid), scale (pilot, demo or commercial) and status (planned,on hold, under construction, under commissioning, or operational). Each individual entry includes data on the project name, location, technology, output, facility type, total investment and a technology brief on each project, plus contact information and project photos. NREL also has an online interactive mapshowing the locations of 2,000+ E85 fuel stations around the country. The map plots the location of ethanol plants as well as E85 stations, and includes propane, hydrogen, and other alternative fuel locations. Locate biodiesel plants in the US and Canada on Biodiesel Magazine’s interactive map. Currently, large efforts are dedicated to the production of biofuels from lignocellulosic raw materials. While only few production facilities are operational yet, many projects are under construction or planned. But which are the companies involved, where are production facilities under construction, and which technologies will be applied? In order to answer these questions, IEA Bioenergy Task 39 has collected data on pilot and demonstration projects and displays the results in a web-based, interactive map. The US Department of Energy’s National Renewable Energy Laboratory’s BioEnergy Atlas maps allow you to compare and analyze biomass feedstocks, biopower and biofuels data from the U.S. Department of Energy (DOE), U.S. Environmental Protection Agency (EPA), and the U.S. Department of Agriculture. 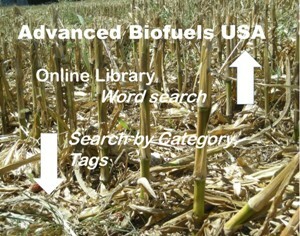 It iincludes a BioPower Atlas and a BioFuels Atlas. The Sustainable Energy and Climate Change Initiative (SECCI) and the Structured and Corporate Finance Department (SCF) of the Inter-American Development Bank (IDB) have created the IDB Biofuels Sustainability Scorecard based on the sustainability criteria of the Roundtable on Sustainable Biofuels (RSB). The primary objective of the Scorecard is to encourage higher levels of sustainability in biofuels projects by providing a tool to think through the range of complex issues associated with biofuels. Since the scientific debate around these issues continues to evolve, the Scorecard should be seen as a work-in-progress and will continue to be updated and revised as needed. 1. Locations of the companies in the 50 Hottest Companies (2009) in Bioenergy. Free download. 2. Locations of pilot-scale projects of the 50 Hottest Companies (2009) in Bioenergy. Free download. 3. Locations of demonstration-scale and commercial-scale projects of the 50 Hottest Companies (2009) in Bioenergy. Free download. 4. Locations of pilot and demonstration-scale projects that received support in the $564 million Department of Energy IBR grants, announced December 2009. Free download. The Renewable Energy Policy Network REN21 launched its Renewables Interactive Map (beta-version). The Map contains a wealth of information on renewable energy, including support policies, expansion targets, current shares, installed capacity, current production, future scenarios, and policy pledges. The REN21 Secretariat collects the information from various reports, databases, news announcements, specific enquiries, and other sources. Designed as a central access-point to renewable energy information, the Map is dependent on the knowledge contributions of many organisations and individuals in the renewable energy community. REN21 strives to cite the sources for all the information presented, so that users can access further information directly. As the network of the renewable energy policy community, REN21 has provided authoritative information for several years, in particular through its Renewables Global Status Report. As a new tool for REN21’s knowledge management, the Renewables Interactive Map is designed to track more closely the dynamic development of renewable energy policy-making and market development, and to provide disaggregated information for specific countries and technologies. A tutorial video provides guidance on how to use the Map. Penn State Institute of Energy and the Environment. Browse upcoming national and international energy and environmental conferences: Conferences are listed chronologically by date with the most recent listed first. Shell Eco-Marathon challenges high school and college student teams from around the world to design, build and test energy efficient vehicles. With annual events in the Americas, Europe and Asia, the winners are the teams that go the farthest distance using the least amount of energy.